Tracksounds: 8 Tracks from Bioshock 2 and Dante's Inferno by Garry Schyman! 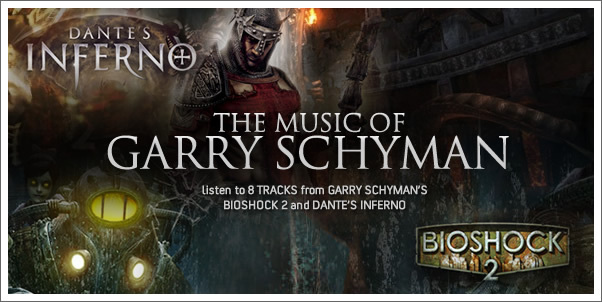 8 Tracks from Bioshock 2 and Dante's Inferno by Garry Schyman! Ever heard someone say "That's just scary-beautiful"? Well, that phrase goes a long way in describing two of composer GARRY SCHYMAN's latest game scores: DANTE'S INFERNO and BIOSHOCK 2. Tracksounds is pleased to present 8 tracks from these two scores just for your listening pleasure.